Ten years ago, organic brand Lazzaretti decided to focus on a 100% plant-based future – a decision dictated by the need for people to rebalance their diet with plant protein. Through this strong belief, we aim to help economise the planet’s resources and make wellbeing central to people’s diets through sustainable, environmental actions. Vegan well before it was trendy! Our corporate philosophy is based on the need to build together a world that’s more in harmony with nature; and to respect the environment, crops and soils. 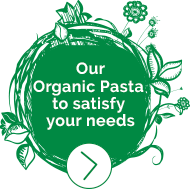 We strive to do this by selling pasta made only with organic ingredients grown without pesticides or chemical fertilisers. Demeter is the largest international certification body for biodynamic farming. It guarantees that farms comply with biodynamic practices and respect the quality of their products during processing. This means: “a mode of organic farming which considers that quality food can only be produced on a healthy soil”. Biodynamics therefore promotes “greater soil biodiversity”, strengthens “plant health”, takes account of “seasonal and cosmic rhythms”, and builds “harmonious landscapes”. Now dedicated to making organic pasta, we are striving to go further and embedding our action in a broader programme of environmental responsibility. This is why, in recent years, we have set up partnerships to develop local supply chains. Our gluten-free supply chain of legumes is a textbook example as it covers every stage – from dedicated plots of land to allocated equipment (farming machinery and grain silo) and a dedicated mill for processing, through to the bagging of our legume pasta for chickpeas, green lentils and split peas. The same model is used for our pasta made with einkorn wheat from Provence, Ardèche chestnuts, spelt, buckwheat and quinoa – all of them French-grown raw ingredients that showcase and add value to our land, and encourage local and other French organic-farming actors to develop their activity. Since 2014, some of our durum wheat has come from our home region of Provence – a local supply chain that we intend to develop in the coming years. This short food supply chain is doubly beneficial, reducing distances travelled by our supplies and the production of greenhouse gases. A great partnership with French organic farmers and producers around split peas, green lentils and chickpeas. Fields dedicated to gluten-free production (no rotation with wheat) with organic seed varieties. Farming machinery and storage silos dedicated to gluten-free production. A dedicated gluten-free mill for processing into flour and semolina. Transport by dedicated gluten-free truck. Delivery to Lazzaretti’s gluten-free production facility. Find out more about the wire-drawing process.